I already setup my credit management. 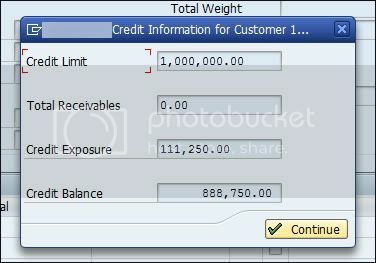 It seems to work well because when I create sales and bill it, I can see that it has reflected to FD32 (credit window). My problem is, how can I make this window (see [image|http://i1104.photobucket.com/albums/h336/809836724/sd/credit_limit_popup.jpg]) appear on sales order, before finishig the entire document? pls guide me how to make it appear. I have problem about the sales order and credit limit. when i do Vl01N, it says that this error (see [image|http://i1104.photobucket.com/albums/h336/809836724/sd/credit_0002.jpg]). I am pretty sure that it has not exceeded the credit limit because I checked FD32. but why it is appearing? How to resolve this? The only time I could get passed to it is when I release it from VKM1. also, my document type in tcode OVAK is set to D.
You have set the BLOCK indicator against DOCUMENT VALUE and maintained the doc value as 1. So, whenever you create an ORDER, the system will block it, if the order value exceeds 1. That is the reason, why you are getting an error. 1. 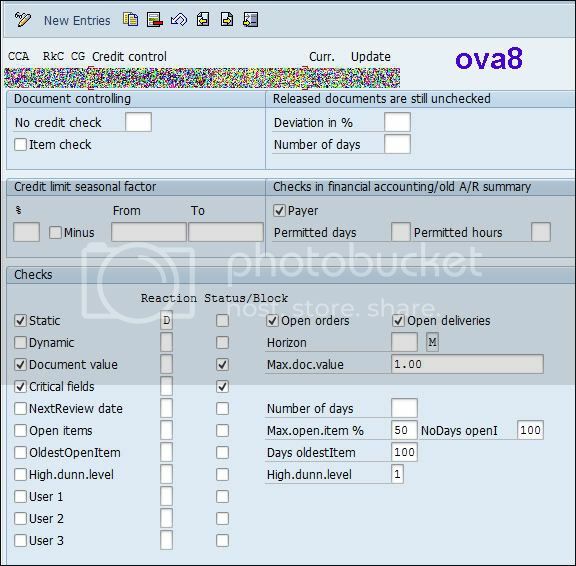 As per standard SAP you can not see the customer credit history sale order,go to T.code OVA8 select your control area in that document controlling tab tick on item check,as per this whenever you enter the line item at sale order if the credit limit exceeded for the customer system will show the message.If you want the information as per the attached picture you need to gofor enhancement. 2. It might be happen because of open items, check at OVA8 whether open orders are check for the controlling are due to this system will calculate the amount of the open order and as per the limit it might be blocking the sale order. There are 2 things you need to check. First check if there are any open Deliveries in VL06G and VF04 and next check for open orders in VL04 or BF05N - open orders. Secondly, go to T.Code FD32 and in menu bar select Environment - Sales and Distribution Docs- Open Orders and similarly check for Open Deliveries/Billing Documents in same menu path. Check if the value of open deliveries shown here is tallied with open deliveries from VF04 and VL06G. If it is not same then revert. In the sale order screen, follow the menu: Environment --> Partner --> Display Credit account. this will show the details which you have requested. Does this meet your requirement? There could be overdue open items or oldest open items or any critical fields (like payment terms) may have been changed manually. Could you please update the settings that you have maintained in OVA8? I am on the testing stage and that customer is newly created and this is the first sales order of the customer. I am really confused because when you released it on VKM1, it goes w/o problem. I suppose it that error should not happen because this is a very new customer and first time to make sales order for that customer. actually it is now working since last night after I removed check mark on document value. Still, you solved my issue because of your previous post. thanks to you and to all of the people here.